To be honest with you, I really wish I’d never have to revisit this blog. Actually, I wish I’d never had the feeling of needing it! Now before you start freaking out, this isn’t about my personal cancer journey. I just have to let some things out. I got a call today that it’s time for my semi-annual scans. Because I’ve been PET negative for a year, Dr. Sharman is fine with me having just a CT (CAT) Scan this time. Ok, no big deal. Also my 3 month checkup happens to be this month on the 16th. Fine. This doesn’t bother me. I’ve had a few weird things crop up in the past year or so – like a walnut/tree nut allergy. What’s up with that? I love nuts! Grr. Anyway, I got home tonight and Tom told me that he saw on Facebook that a friend of mine had something big happening. I said, “What?” He said, “She just found out she has cancer.” WHAT????? Just typing this pulls the feelings to the surface again. And just want to scream! I’ve been sitting here on my bed, rocking like a crazy person with tears streaming down my face. Sobbing like a baby with my breath coming in choked gasps. Why? Please pray for my friend Danielle. She has been diagnosed with colon cancer. She has been through way more than ANY new mommy should ever have to go through. I got an idea from a friend yesterday on Facebook. She’s actually a friend in real life too – amazing but true, I know. 🙂 Anyway, she had posted a photo of a paper someone had put out for their kids. Simply said, I LOVE THIS!!!! Let me be honest here. I love technology. At work, I’m one of the geeks. If my office door is open, I will frequently have people coming into my office asking for help with some computer issue or another. I have fun with it, and am really glad they feel comfortable asking. So I can be totally understanding when it comes to my kids wanting to use the computer and being online. It’s fun after all! Lately I was thinking that I wanted to monitor things a little better for my kiddos. I mean, I am their mom. It’s their dad’s and my job to make sure that they grow up to be well balanced human beings that contribute well to society. In light of that, I just thought that unlimited access to the internet at all times is probably not a good idea. I contemplated shutting off the router at night, but that would affect me too, and I’ll be honest, sometimes I would have to work late, so that option wasn’t very viable. But what to do? Fast forward to yesterday. 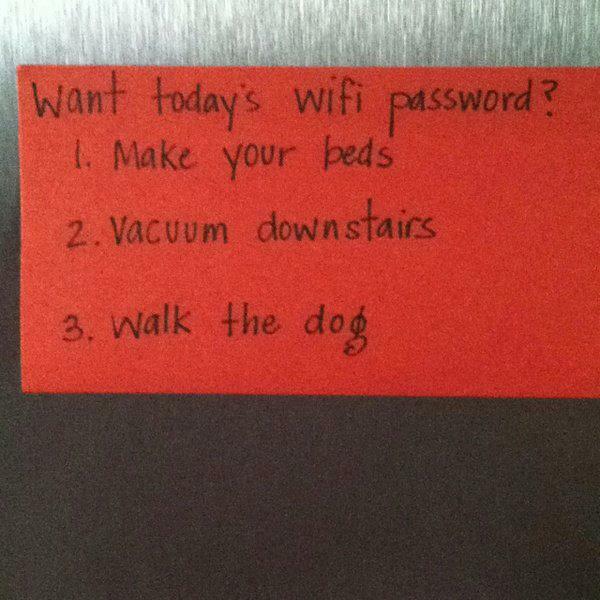 I think this idea may make a huge difference in our household. At this point, I’m planning to have a list of chores that they will need to do for that day. They most likely will change from day to day, but will always include having their homework done! 🙂 I suspect we will get a little push-back from them, but the fact is, I’m the mom. Period. End of story. We are truly not doing this to be mean, we just want what’s best for our kids. I know they’re not going to think this is cool, and perhaps we will be hated a while for it. Time will tell.